years. There have been many changes in spray foam suppliers and SPF equipment in the last few years; many spray foam suppliers and manufacturers are rolling out different options, colors, functionalities, services, and more. Sure, you now have many more choices, but you also must conduct more thorough research into the brands and equipment to choose the right SPF product for your specific job. Based on experience, we can attest that all spray foam suppliers are not alike. For example, some distributors have been around for a long time, and have many years of experience with spray foam; others are relatively new to the industry. Or, some spray foam suppliers focus on open-cell foams with lower R-value that can be used primarily in residential buildings, while others offer a full range of SPF for residential, commercial, agricultural, and roofing uses. Some offer internal training and certification programs and develop best practices to share with professional contractors; others rely on external organizations to provide training. What is the lesson here? Choosing the right spray foam supplier has never been more vital to the building industry. You want products you can trust, provided by a supplier you can trust. Do they have particular materials suited for your application? Are they geographically convenient to support you with parts, supplies, materials, and more importantly, technical service? Do they have experience in the applications your business supports? Do they carry well-known brands? 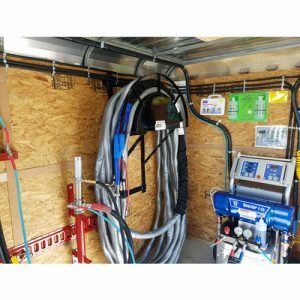 As a leading SPF equipment supplier, Intech Equipment & Supply offers SPF contractors spray foam equipment, mobile spray foam rigs, parts, education, training, troubleshooting, and many other customer support services. Our team of professionals is a talented group consisting of leading spray foam equipment experts in the field who are incredibly passionate about what they do. With more than 20+ years of combined experience in the residential and commercial SPF roofing space, our team members are certified experts and the most knowledgeable support professionals in the industry.